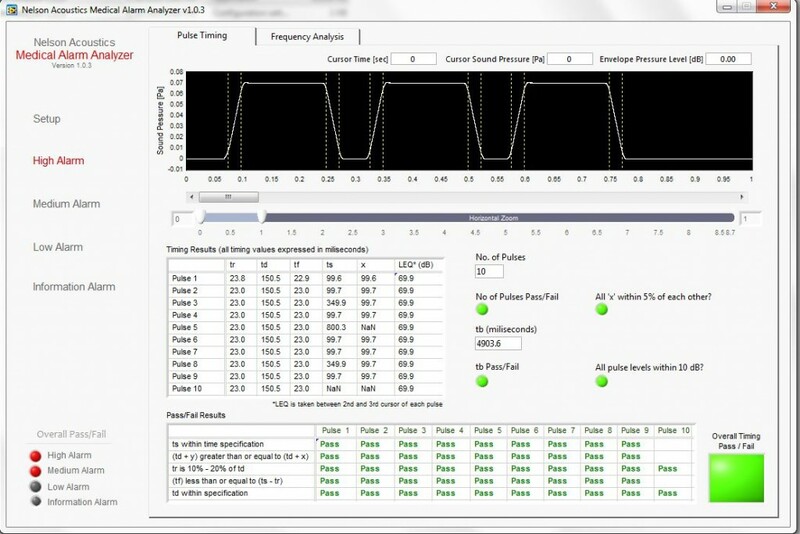 The Medical Alarm Analyzer conducts time and frequency analysis of medical equipment alarm signals for compliance with IEC 60601-1-8 requirements using audio WAV file recordings of the alarm signal. Medical Alarm Analyzer is an executable, plug-and-play application that will work with WAV file recordings generated from any recording device. The medical alarm analyzer is designed to analyze WAV file recordings of medical alarm signals in accordance with the requirements of IEC 60610-1-8. MAA conducts frequency analysis on alarm signals to insure the spectral content meets IEC 60601-1-8 standard for required harmonics in the signal.